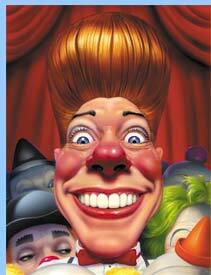 Bello Nock is one of America’s top clowns. A member of the famous circus dynasty “The Nerveless Nocks” (his family founded Circus Nock in the 18nth Century in Switzerland! ), Bello has been entertaining people in the circus since he was in utero. At age 6, Bello played Michael Darling in the touring version of Peter Pan with Cathy Rigby. He later became a featured performer as a member of the Nerveless Nocks, and has starred as the feature clown for Circo Atayde, Big Apple Circus, and since 2001, Ringling. Bello has won a number of awards for his work, including a 1998 Monte Carlo Silver Clown Award; two best comedy acts at the Sarasota Circus Festival; and the title “Best American Clown” from Time Magazine. Bello is quite a skilled performer- he is a great musician, juggler, acrobat, and improviser. Not only is he well known not only for his patented big hair, but also for his energy and enthusiasm for his work. He is reported to rehearse and practice 8 hours a day, in addition to performing and doing publicity. 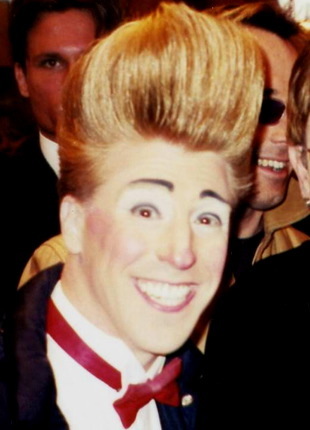 Bello Nock wins Golden Clown Award at Monaco!